Since then, I had hoped for a second visit from this beautiful butterfly, but yet to materialize. I’m still hoping though! Would out of sight be out of mind for this beauty? Certainly not! It should not go into oblivion! Thus, I’m presenting an article here about this beautiful butterfly species so that it be given a rightful place in our tropical wildlife photo gallery. 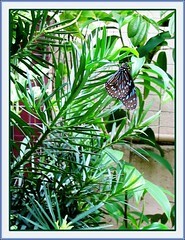 Dark Blue Tiger is a large tropical butterfly with migrant tendencies. A slow leisure flier with a wingspan of 8-10 cm and considered an inedible species by predators because of its toxicity and unpleasant taste. It bears striking color combinations. The upperside of wings are black with pale blue markings of varying sizes and shapes, giving it a lovely spotty look. Narrow blue streaks radiate from the basal part of wings and markings broaden and lighten towards the outer margins. The hind wings has a characteristic wishbone marking in the cell, formed by 2 streaks joined at the base. The wings underside ground color is dark brown with similar markings as on the upperside. Both the male and female species are similar, and the only distinguishable sign is the elevated scent patches located on the second vein of the underside hind wings of the male. Range: Afghanistan, Himalayas to Southern India, Pakistan, Sri Lanka, Myanmar, Thailand, Laos, Vietnam, Hainan, China, Taiwan, Langkawi, Malaysia, Singapore, Indonesia, Australia and New Guinea. Habitat: Disturbed areas with secondary vegetation, scrubland, fringes of forests, rainforests, gardens and hedges. Seen up the hills too but common at lower elevations during wet weather. Food plants: Species of Asclepiadaceae (milkweed family) or Apocynaceae. 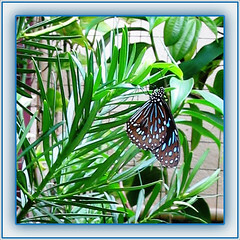 Other interesting facts: The Blue Tigers consist of a few Danaid butterflies that resemble one another quite closely. Similar species of this group are the Blue Tiger, Glassy Tiger, Blue Glassy Tiger, Female Dark Wanderer and Common Mime. Have a look at their images and distinguishable features at Butterflies of Sri Lanka.